Expanding modern town with evidence of Romano-British activity and origins as medieval castle borough, and late medieval and 17th- to 19th-century buildings. Evidence of Romano-British settlement and a possible Roman fort have been found below the eastern side of the modern town. The site became the administrative centre of the medieval cantref of Dyffryn Clwyd and may already have formed a nucleated settlement by the early 13th century. The cantref was granted to the Welsh prince Dafydd ap Gruffydd, brother of Llywelyn, by Edward I, who began construction of a royal castle in the town in 1277, the only town in the lordship of Dyffryn Clwyd. 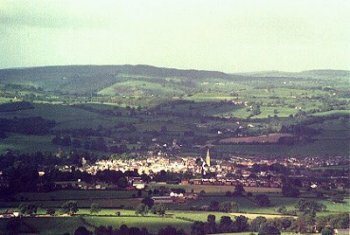 Following the Welsh war of independence in 1282 the cantref was confiscated and granted to Reginald de Grey as the new marcher lordship of Ruthin and although its population retained a significant Welsh element, like Denbigh the town and its immediate hinterland became a focus for English settlement, the land in which it was sited having been taken from the parish of Llanrhudd. Sited on a distinct sandstone hill which rises above the bottom of the vale, between a height of between about 60-90m OD. Unlike Denbigh, the medieval town was never to be provided with stone defences, but it seems reasonably clear that the medieval town occupied a relatively small area between the castle on the south, St Peter's Church on the north, the river Clwyd on the west and Wynnstay Road on the east. The town expanded beyond these limits during the course of the 17th and 18th centuries, and during the 19th and 20th centuries has extended onto the low ridge to the east of the town centre and the lower ground across the river to the west, occupying parts of the former ecclesiastical parishes of Llanynys and Llanfwrog. A medieval mill was established on the river Clwyd, on the western side of the town during probably during the late 13th century, becoming an important cloth-producing during the medieval period, with its own guild of fullers and weavers. It remained a relatively small town during most of the medieval period, however, with a proportion of its inhabitants engaged in agriculture. During the later medieval and post-medieval periods the town developed into an important market town and commercial centre serving the southern area of the Vale of Clwyd. St Meugan's church, Llanrhudd, the parish from which the medieval borough was created, continued as the mother church of the town during the medieval period. The new church of St Peter's was founded in the borough for the burgesses in the 1280s, being rebuilt as a collegiate church by the de Greys in 1310. A number of nonconformist chapels were established during the 19th century.